Just want to share the specifications of the iPad 2 . iPad 2 is a great gadget specially for geeks who love to read and play. It has a good size and weight that make a travel friendly gadget. 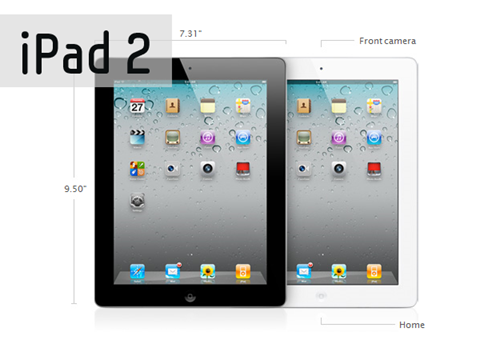 Processor: Apple-A5 dual core processor (2 times faster than iPad’s processor). Camera: Front facing video camera. HDMI Support (provides output up to output 1080p). Comes in two colors (black and white). Wi-Fi version costs $499 and Wi-Fi+3G costs $629 for 16 GB model. Flap covering front side of the iPad 2. I love to have this one. My wife already owns one.